I had the privilege to attend the 7th annual WFDU fundraiser event given by Vicki Sola. Vicki has been the host and producer of the popular radio program "Que Viva La Musica" since 1984. This weekly Saturday afternoon radio program, which broadcasts from 89.1 FM to the greater New York/New Jersey metropolitan listening area, features straight ahead salsa, Latin jazz, and interviews with musicians. It was a great night of fun for all. 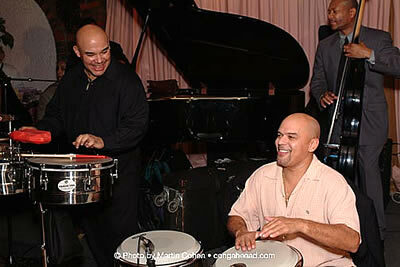 Latin Percussion donated a pair of Bronze Shell Tito Puente Tribute Timbales which were raffled off. Notable musicians who performed on this evening were Little Johnny Rivero, Pablo Chino Nuñez, Eric Velez, Orlando Vega, Jimmy Bosch, and Dave Santiago among others.